Iodine, symbol I and atomic number 53, is named from the greek work “iodes” which means purple or violet. This chemical element is a lustrous and bluish-black solid that sublimes at room temperature and turns into a blue-violet gas with an irritating odor. It is also used for the production of thyroxin, thyroxine and other hormones by the thyroid gland that in return regulates the body’s conversion of fats into energy, controlling cholesterol levels and stabilizing the weight of the body. Used as a general sterilizing agent. Nearly all sterilization products have iodine in them as it is an excellent cleaner of wounds. It can also be used as water purifier in either solid or liquid form. Exposure to radiation. The compound potassium iodide is used in helping individuals who have been exposed to radiation by means of reducing the accumulation of harmful radioactive substances in the thyroid. Boosting metabolism. The body’s metabolism can slow down due to improper function of the thyroid gland. Supplementing with nascent atomic iodine can provide aid in ensuring the smooth functioning of the thyroid that will in turn help in regulating the metabolic processes. Iodine can also help in steadying the heart rate, keeping the body warm, promoting overall digestive health, and maintaining a healthy body weight. Goiter prevention. Goiter is a due to the inflammation of the thyroid gland and the throat area. For this condition to be prevented there should be regular dosage of a nascent atomic iodine supplement that can help boost the general thyroid health. Bacterial infections. An iodine solution is known in assisting the body’s fight against conjunctivitis and other bacterial infections. Iodine tonic that is used as a throat gargle helps in treating cough, and can also be used as an expectorant of mucus for flu and colds. Ovarian health. Recent studies have shown the direct relation of ovarian problems, such as cysts, and iodine deficiency; and reproductive ability. Breast health. Iodine is a key mineral in breast milk that is being passed on to infants to promote growth and development. Research is currently being conducted with regards to the role of iodine in prevention of breast cancer, breast health and the overall breast function and shape. Neurological health. Individuals can suffer from mental disabilities and illnesses due to lack of iodine. It is essential that there should be regular intake of right amount of dosages of iodine, based on one’s health needs. Iodine is naturally found in rock, some types of soil and most especially in seawater. Foods that are highly rich in iodine include shellfish and sea fish. 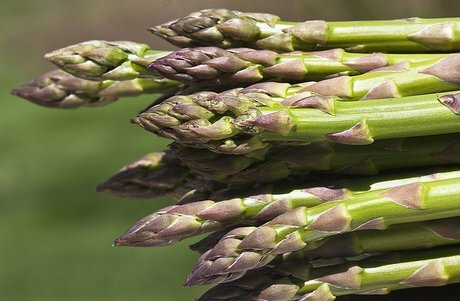 Some other food sources include seaweeds (especially dulse), asparagus, lima beans, garlic, mushrooms, sesame seeds, spinach, soybeans, swiss chard, summer squash, and turnip greens. It can also be found in foods such as grains and cereals but the amount is dependent on the level of iodine in the soil where it is planted and grown. Another very important source of iodine is sea salt. Further information on Iodine rich foods and an Iodine Rich Foods List. An Iodine deficiency can result in unhealthy hair, rough wrinkled skin, fatigue, anemia, lethargy, goiter and low blood pressure. Overdosing of iodine on the other hand, can result to alteration of the function of the thyroid gland. This can cause a variety of symptoms that include excessive weight gain. Asparagus photograph by Muffet; Office of Dietary Supplements; Linus Pauling Institute; Vegan Health; Wikipedia.